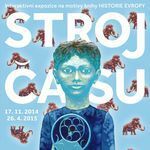 Within the frame of an International Visegrad Fund grant, OSA participated in an exhibition on Europe’s history from the prehistoric times to the present produced by Sladovna Písek in the Czech Republic. The interactive exhibition, based on the Czech illustrator Renata Fučiková’s book History of Europe, as well as the accompanying educational programs are meant to provide children and youth with a view on how life in Europe has changed in the past 1000 years and what major factors and events have shaped the course of history. OSA contributed to the second part of the exhibition aimed at youth of 12-16, in which the installations trace specific topics from the Enlightenment to the present with a special focus on life and developments in the Visegrad geopolitical region in the 20th and 21st century. This part includes chapters such as the Dissidents’ Living Room, which concentrates on the post-WWII Communist rule and the regime changes of 1989. Combining the personal and the political, this chapter will also give visitors the opportunity to learn more about dissidents, resistance to the Communist regimes and human rights movements through original archival material. Among the documents selected for the exhibition were educational films produced by the Czechoslovak state security, Radio Free Europe/Radio Liberty documents on the Czechoslovak democratic opposition and specifically Charter 77, and items from OSA’s unique samizdat and periodical collection. Photographs from the OSA related Fortepan and Hungarian Policeman digital photo archives were also included. The exhibition runs until April 25, 2015.